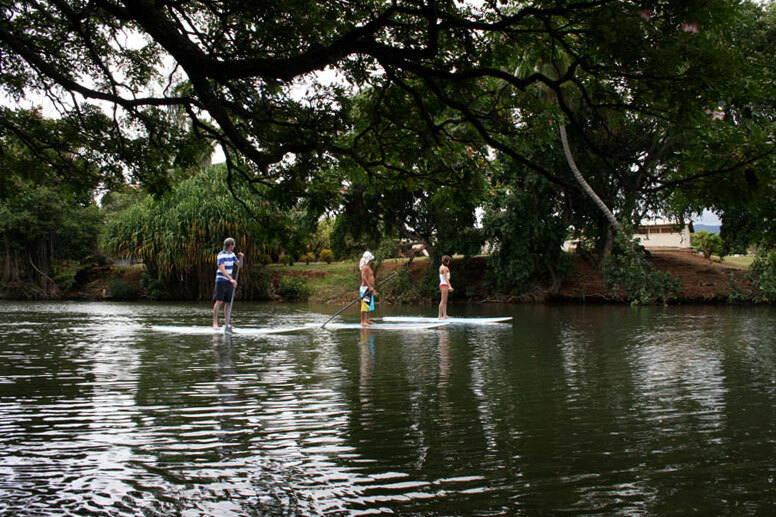 Get outdoors and enjoy one of the best locations that Hawaii has to offer in a gentle, relaxing and fun experience. 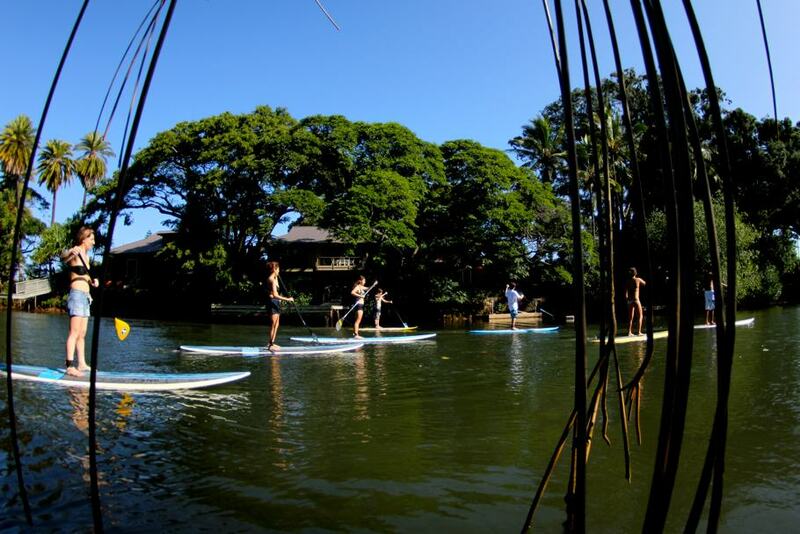 If you’re looking to learn to stand up paddle while you’re in Hawaii, or if you simply want to have an awesome time in a true paradise, this is your activity. Read below for more info! We put a lot of care into what we do, and that extends from our students’ safety out on the water to the quality of instruction to the quality of the boards that we provide for you to ride. And that includes having a board that fits your body size and level of experience. We’ve got everything from 12′ Surftech Laird Hamilton models designed by Ron House (a world-reknowned shaper and close personal friend) to 9’3″ “Ripper” custom-shaped boards by Blaine Chambers of Paddle Surf Hawaii (another good friend that we’re proud to know). And we’ve got all kinds of shapes and sizes in between. We know that having a great time on the water starts with having a great instructor and having the right equipment, and take pride in making sure that you’re covered on both of those points! The great thing about stand-up paddling is that it’s so versatile: it can be just as fun on calm, easy water as it is out in the surf. 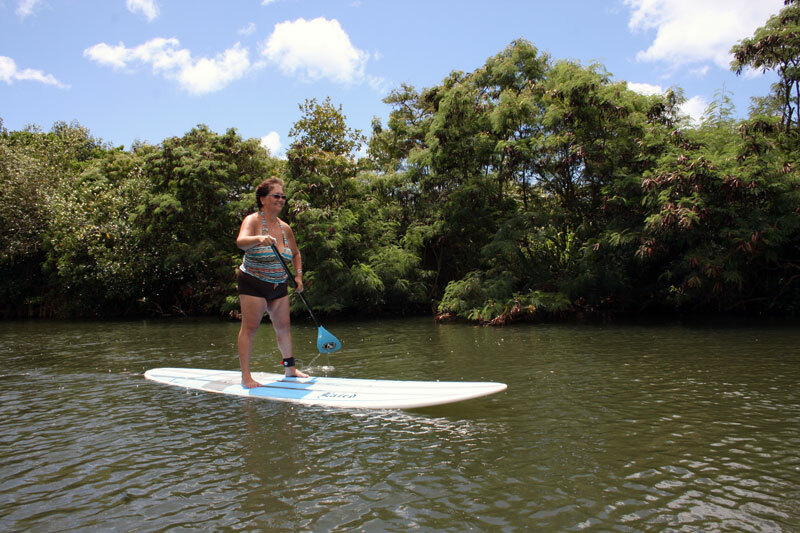 Stand-up paddling is a great way to catch and ride waves of all sizes, a great way to get a full-body endurance and core-strength workout, and a great way to just relax and spend some time out in the beauty of the North Shore’s environment. It’s all a matter of what you’re into and what you like to do. No place in the world has the level and variety of waves that the North Shore of Oahu provides. If you’re into wave riding, we can teach you how to catch waves and we can take you to some of the best breaks on the planet. But we also know that not everyone wants to go charging in the surf. 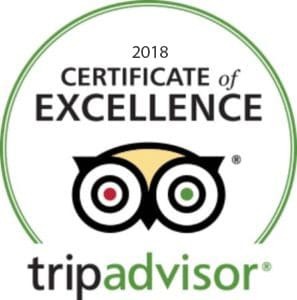 So, while our instructors are all great wave riders, we’ve also got some great easy tours for individuals and families that want to just have a fun, relaxing time outside and on the water. There’s a good chance you’ll see turtles, peacocks, and some other cool wildlife, and you’ll definitely see a lot of the local scenery. Just let us know what you’re interested in and we can put together something that fits you! One of the great things about stand-up paddling is that you don’t need to live by the ocean to do it. All you need is water and a board. And it’s a great way to stay in shape year round. Whether you live on the coast, or near a lake, river, or reservoir, it’s something that you can experience, learn, and keep with you long after you’ve left Hawaii! Get great photos to share with your friends and remember your experience for years to come. Our professional photographer will join you in the water and get perfect shots of you having an amazing time. Just add photos and/or video as an option when you book your lesson online! Some of our friends ripping it up at Puaena Point, a great place for a fun stand-up paddle session, no matter what your skill level! We guarantee your lessons. Sunset Suratt Surf Academy firmly believes in offering an unforgettable stand up paddling experience. If anyone is uncomfortable or unhappy for any reason, they are not obligated to pay. 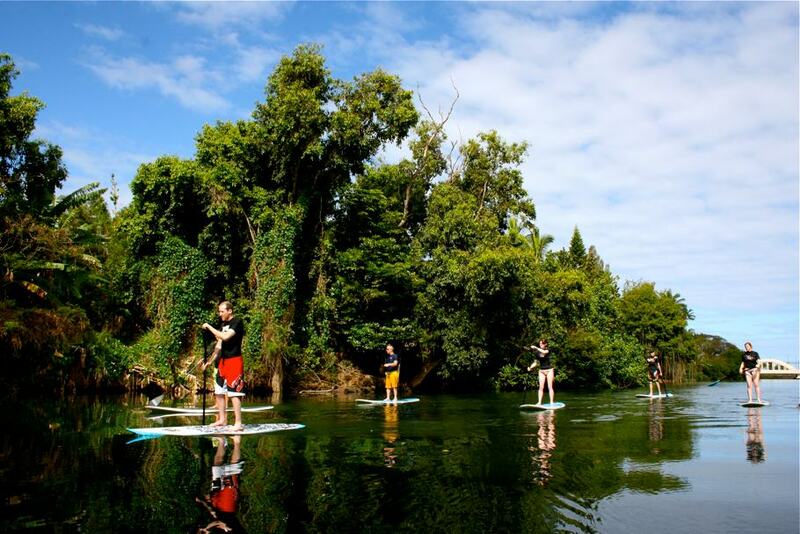 You can book your stand up paddle lessons on our site up to 24-hours in advance and pay with major credit card at checkout. You can also call us at (808) 783-8657 or line up a lesson by email to sunsetsuratt@gmail.com. We look forward to being in touch with you! Have an extra large group or need special accommodations for your lesson or tour? Call us at (808) 783-8657 or email us at sunsetsuratt@gmail.com before booking and we’ll take care of you! 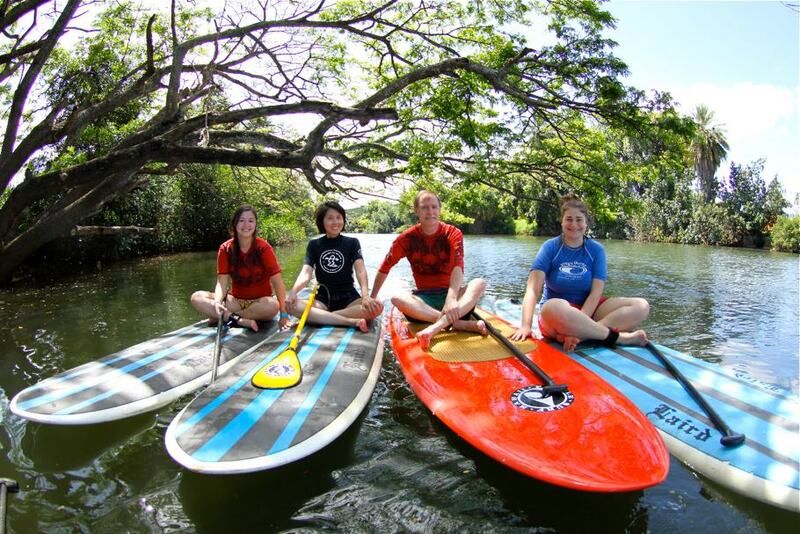 Stand up paddle lessons or tours with Sunset Suratt Surf Academy are a great gift. Purchase a gift certificate online and give the perfect surprise to that special person planning a vacation to Oahu! 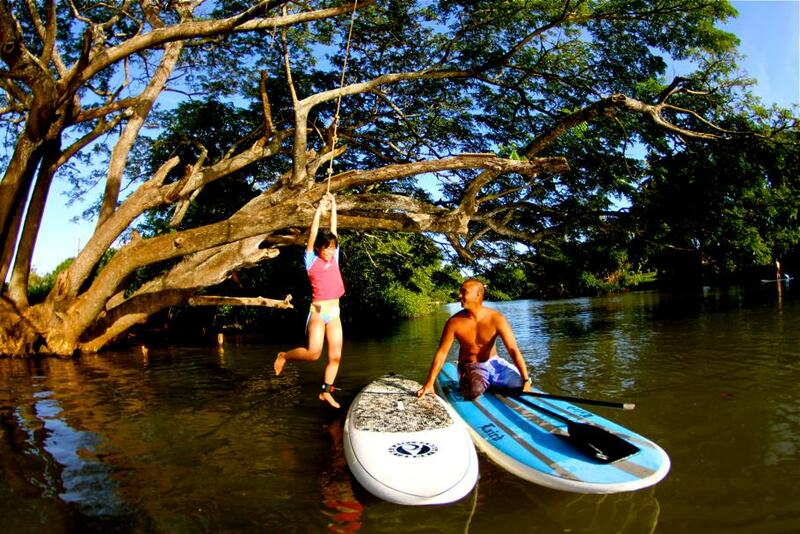 Ready to have an amazing lesson or stand up paddle tour? Book your surf lessons conveniently and securely right here on our website. It’s fast, easy and you can pay with your major credit card at checkout! I’m writing to let you know how glad we are that we chose your school to introduce us to stand up paddle. In the 2 hours we spent with you, we found all the confidence we needed to continue on our own here in Florida. When we returned home we were so excited to go again that we rented boards the very next day, and thanks to all the special advice and tips you gave us, we were more equipped than we realized. Not only did you inspire us with what you taught us, but every time we go out on our new stand up boards we take a little bit of the aloha from our first time with you. Many, many thanks! Bryan, Can’t say enough about the experience our family had with your surfing school. You treated us like we were part of your family. I would recommend your school to anyone. My family has made many trips to the North Shore for our summer vacation and certainly one of the best things we have done was to meet Uncle Bryan. Our daughters have all taken lessons from Uncle Bryan at one time or another. They are pretty good surfers now, but they never fail to learn something from him, either about surfing, or sometimes about life. Last summer our adventure was stand up paddling and we had a blast. We have sent many of our friends to take lessons from Bryan and the crew and nobody has failed to rave about the quality of the experience. If you are thinking of surfing or doing stand-up while on Oahu, give Uncle a try. You won’t be disappointed!